Overheated Auxiliary Power Unit (APU) is what prompted Bhutan Airlines to perform emergency evacuation earlier this month. 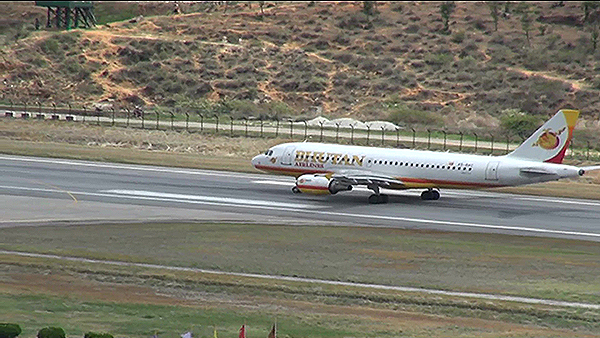 The Bhutan Civil Aviation Authority (BCAA) had launched an investigation following the incident. The investigating team found a carbon seal on the gear box of the APU partially damaged. Also, at the time of the incident, exhaustion fumes from the plane’s engine gushed out at once together with that of the heated APU. According to Bhutan Civil Aviation Authority investigators, an aircraft can operate with the APU inoperative. Auxiliary Power Unit is a gas turbine used by aircrafts for ground operations. Once the plane is airborne, the APU has no function. “According to our regulations, if the APU of an aircraft is damaged, they can fly for 10 days,” the BCAA’s Chief of Flight Safety Sangay Tenzin said. “The unit is required only on ground to start engine and provide air condition to passengers,” he added. Bhutan Airlines has already replaced the damaged APU and the aircraft resumed its flight operations since September 21. On September 9, some 70 passengers and seven crew members of Bhutan Airlines had to be evacuated after a smoke was detected at the tail section of the aircraft. The incident happened at Netaji Subhas Chandra Bose International Airport in Kolkata, India. After being pushed back for taxing, the aircraft was waiting to take off to Bangkok when the incident was reported.